1. 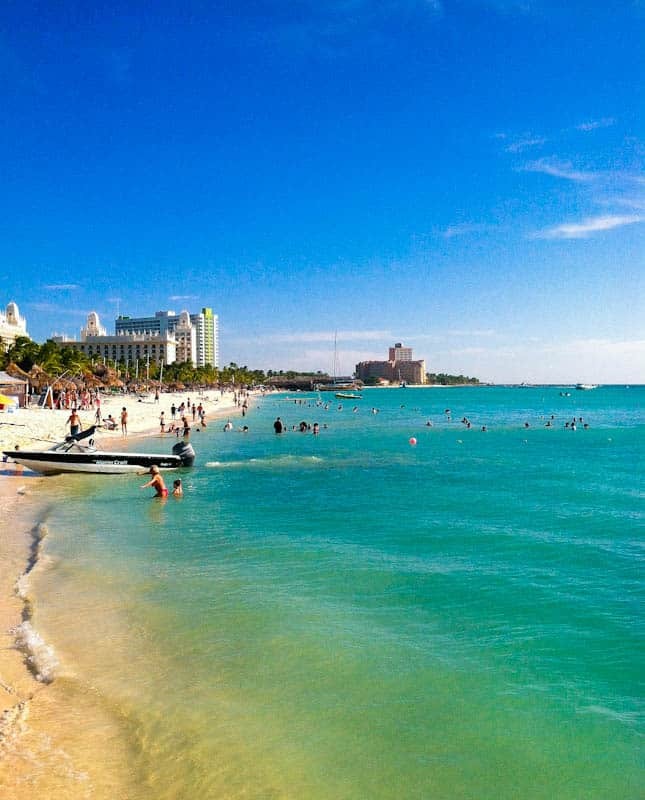 I’m en route to Aruba and we’ll be at our house there for the month of December. We spend December there every year and by the time you read this, I’ll likely have been up for about 36 hours and passed through many airports with a five-year-old in tow. Red-eyes are well worth this view. Daily recipe posts will continue, with more no-bake recipes, plenty of white chocolate, and maybe more banana bread recipes, which are things I seem to make in abundance when I’m there. 2. I was featured in a two page spread in the December/January print issue of Bust magazine. 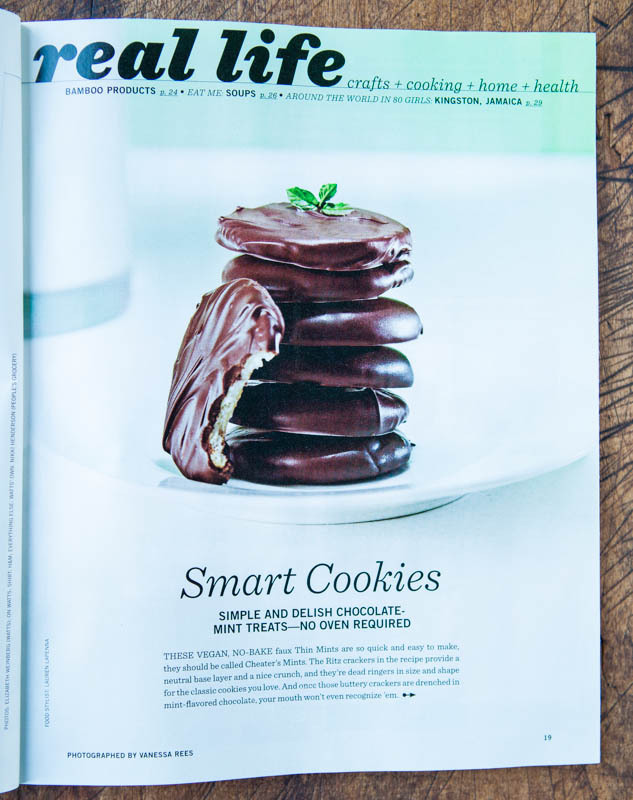 They contacted me months ago about wanting to use my homemade Thin Mints (no-bake, vegan) recipe in the issue. At the time I remember thinking, wow the holidays seem so far off. 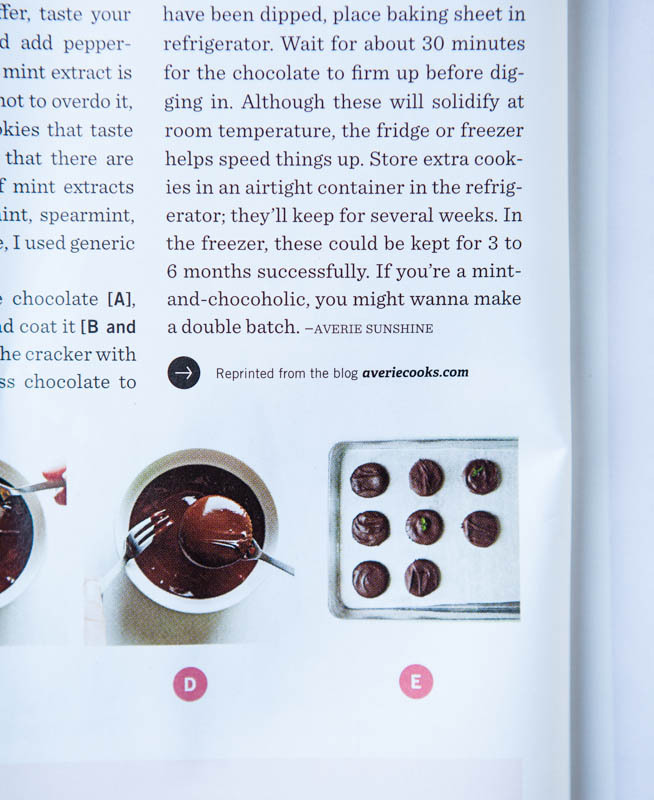 But time flies and the holiday season is here, along with my recipe and name in the magazine. 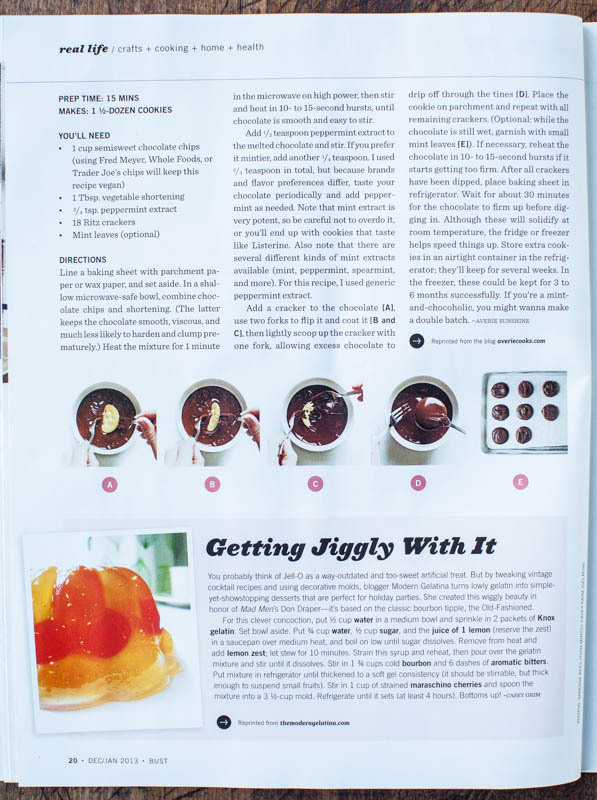 Opening a print magazine and thumbing through it and seeing my name and recipe on the pages is both surreal and wonderful. And a big thanks to Bust for the feature. 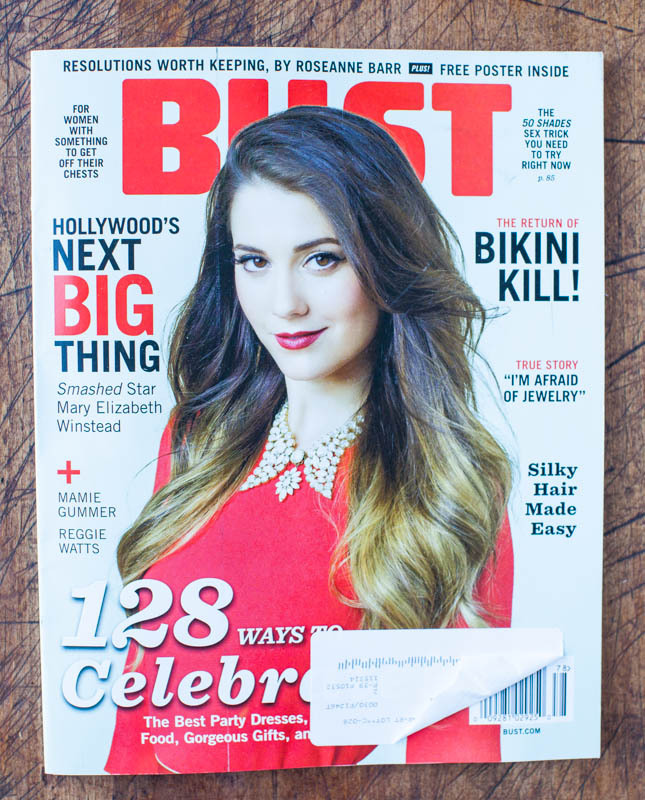 If you’re looking for a hip, fun and fierce magazine with a bit of an edge, and one that proudly celebrates women with features and stories that go a bit deeper than ‘Ten Tricks for Flatter Abs’, check out Bust . 3. 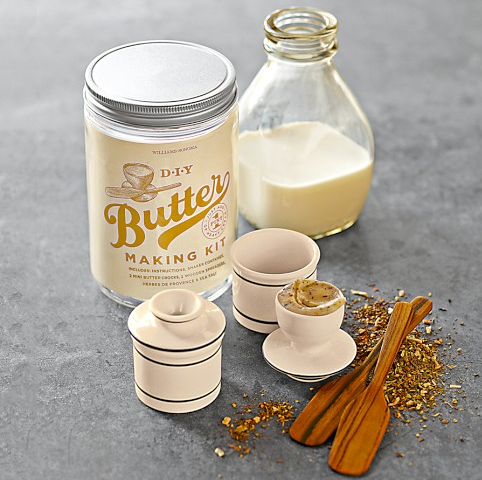 Along with the homemade theme of the cookies, there’s this Butter-Making Kit, $29.95 from Williams-Sonoma. Normally I am not into kits or anything that’s gimmicky, and although you could assemble these items on your own, I think it’s a fair price and the kit would make for a gift that keeps on giving. You supply the cream and the kit can be used again and again for an endless supply of butter, for both a practical gift and one that connects us to how food is made. 6. Raw Eggs – I don’t know why this never dawned on me, but pasteurized eggs are safe to eat raw. Although people in other cultures eat raw eggs, Americans tend to be pretty uptight when it comes to ingesting them. 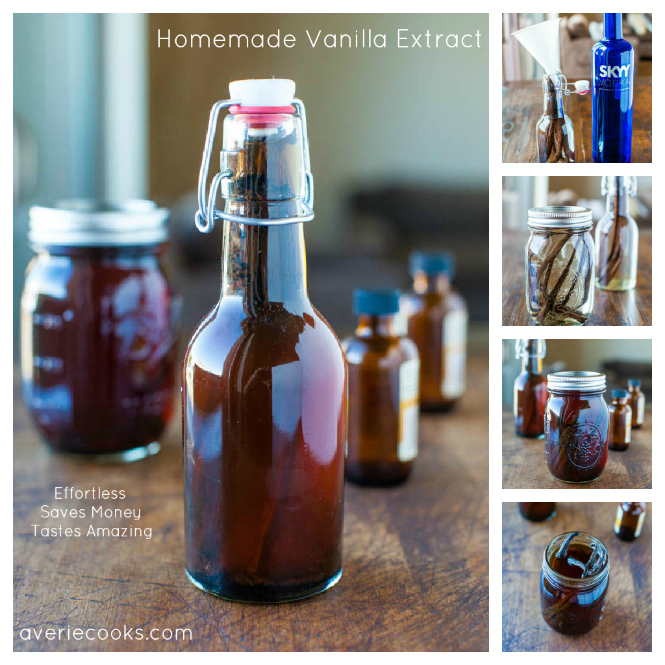 Pasteurization to the rescue. 7. Slow Cookers vs. Dutch Ovens – A conversion guide with pros and cons to each. I have both and almost never use my slow cooker and don’t use my Dutch oven nearly as often as I use my cast iron skillet. 10. Gentle Folding Stops Tough Quick Breads and Brownies and these photos show the differences, and is why I remind everyone, myself included, not to overmix batter and dough. 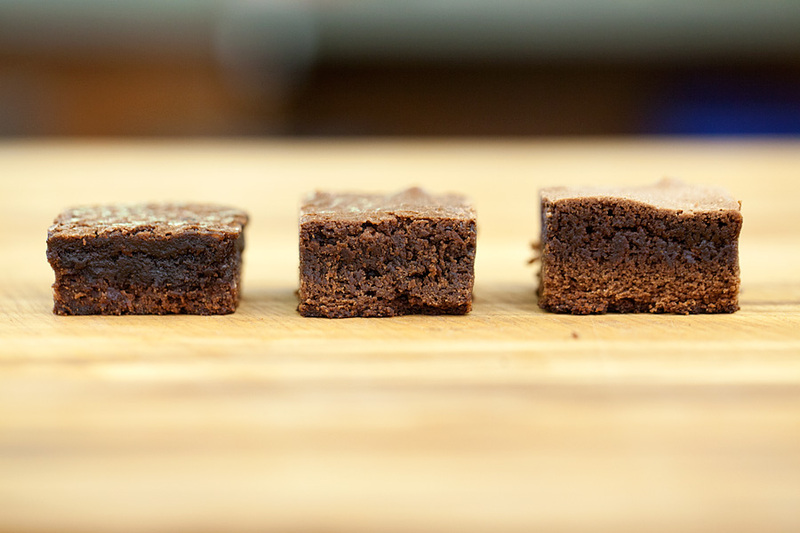 The brownie on the left is a compact, tender, perfectly fudgy brownie with properly folded, batter. In the center, the overfolded sample was relatively cakey and tough. And on the right, the sample whisked with a stand mixer was ‘the worst batch of fudgy brownies ever. They baked up almost twice as tall as the properly folded batch and offered serious resilience. I never make brownies using a stand mixer, just a whisk, and I melt the butter in the microwave with chocolate, add the sugars, eggs, splash of coffee to enhance the chocolate flavor; flour, and whisk until just combined. 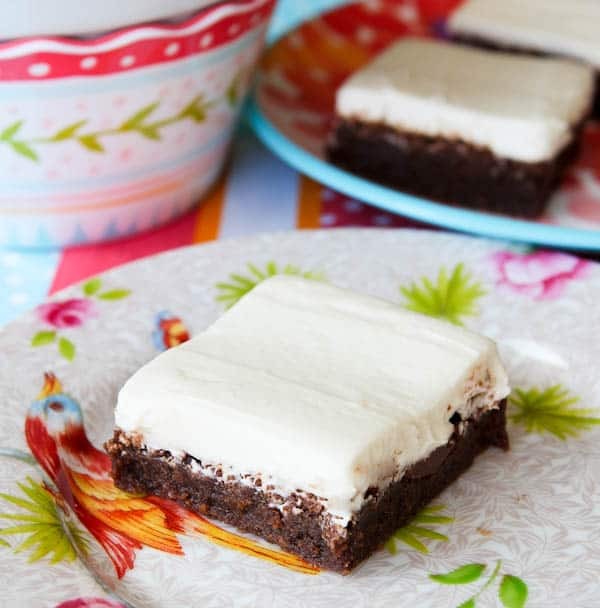 It’s really the simplest brownie recipe and yields fudgy, dense, rich brownies every time. 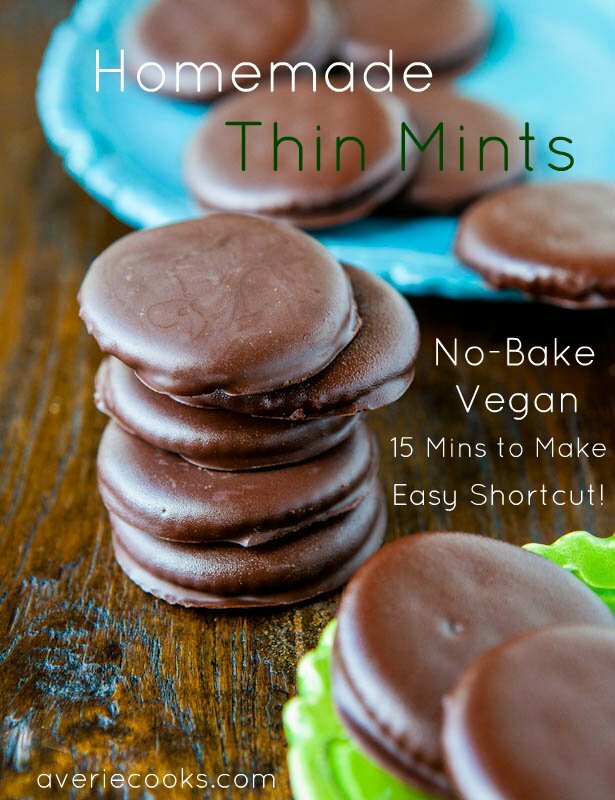 The recipe is as easy as using a boxed mix with far better taste. 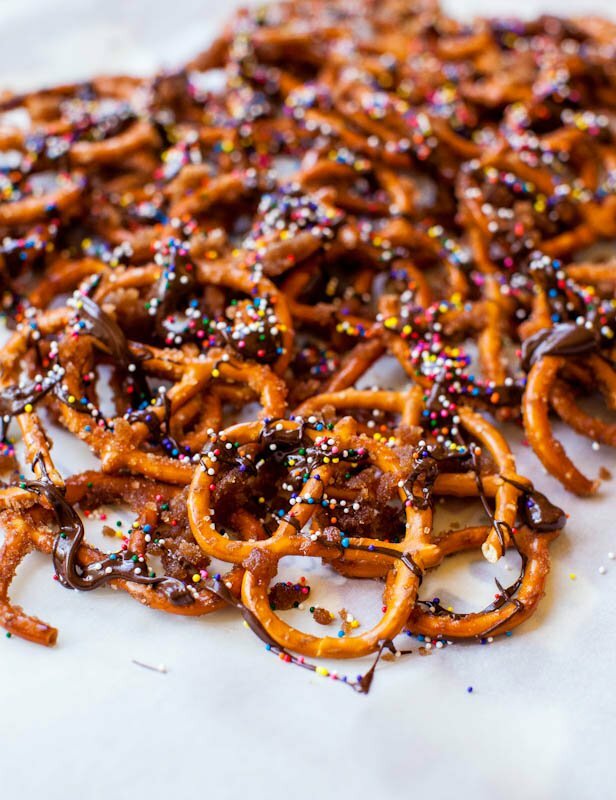 Nutella swirls and cream cheese frosting optional, but recommended. Do you use a slow cooker? Have a great pancake or brownie recipe? Ever made your own butter or are you making any holiday gifts this year? 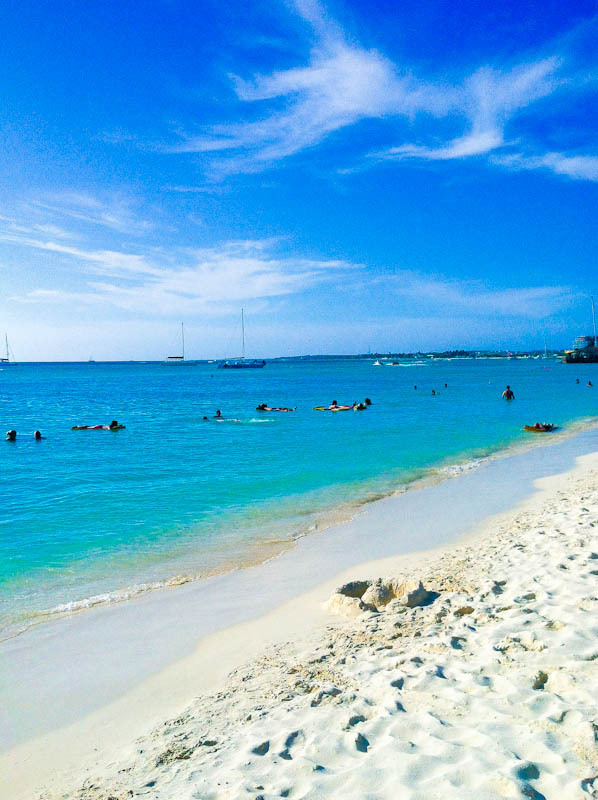 I’ll be unpacking and getting settled into the island flow of life after a twenty-two hour journey to Aruba. Putting the key in the lock the first time after being away for months is always interesting because I never know what’s going to have gone haywire in my absence. 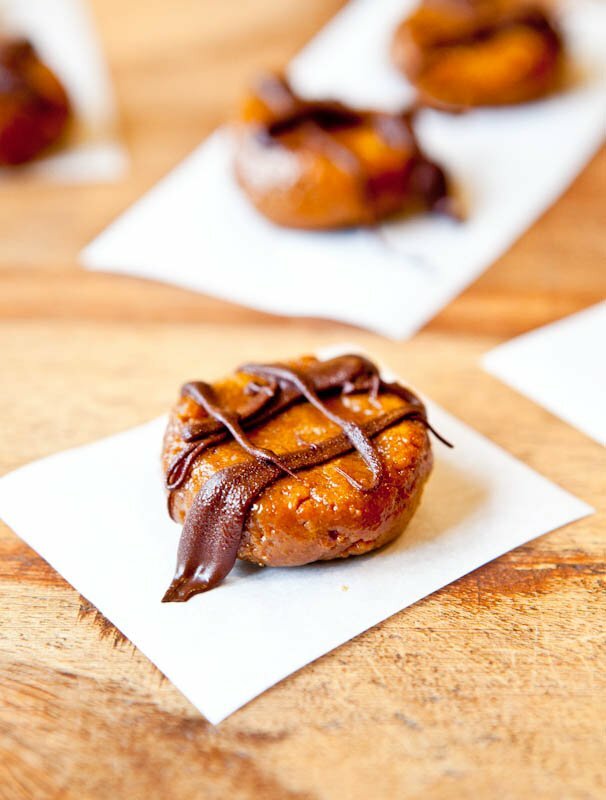 And then it’s off to many grocery stores to obtain holiday baking staples, and of course, the beach. 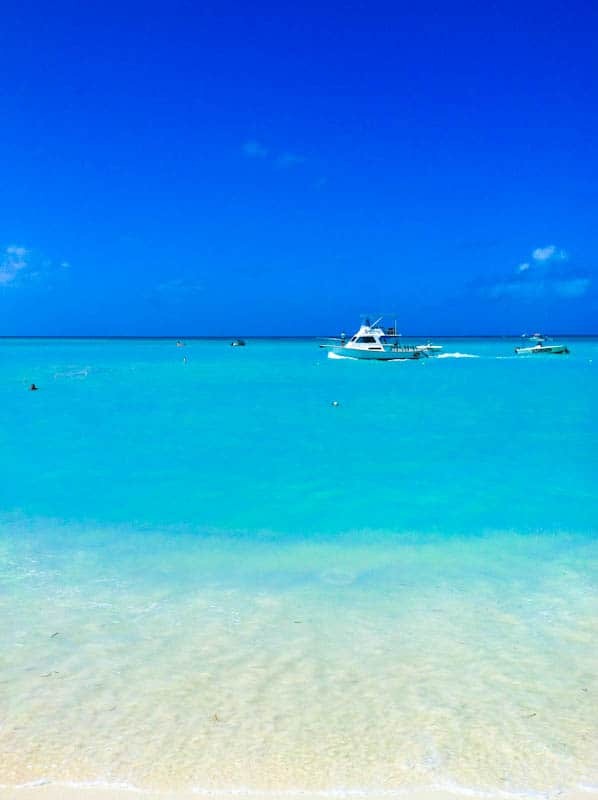 Have an amazing time in Aruba! 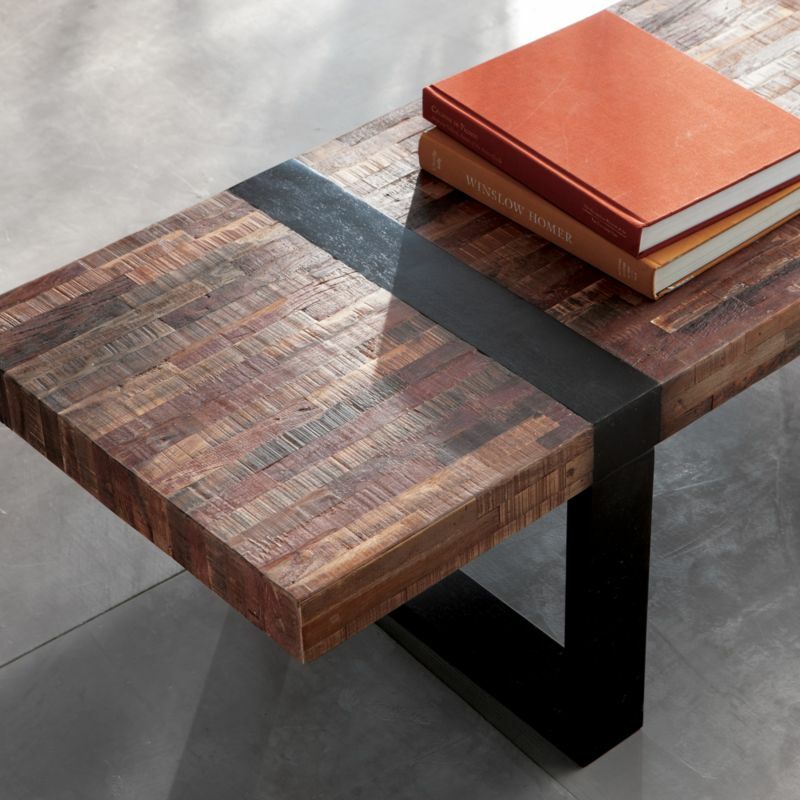 That coffee table is gorgeous! 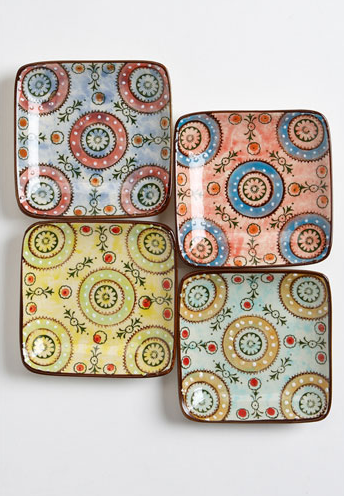 I wish there was a Crate and Barrel in my city. We have no good stores here. Awesome! Congrats on getting publish in a magazine! Also those blue ocean shots are amazing, makes me want to fly down south stat! It’s a long flight but so worth it for the blue ocean pics – and thanks for the nice comment! I made the white choc puppy chow and white choc fudge last year here at this time, yes! And the saltine toffee, too. That recipe all of a sudden has come back to life. Must be a seasonal thing. The step-by-steps are not mine; they wanted to shoot their own and thanks for the HuffPo congrats. 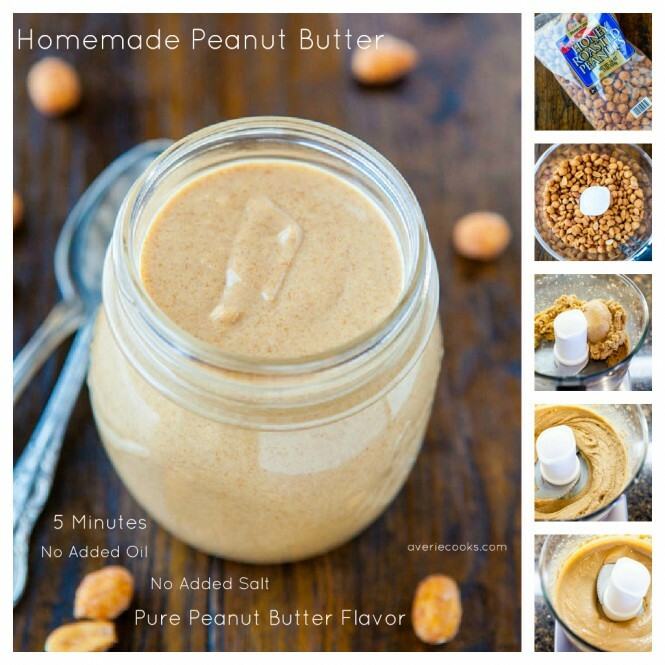 Yes, add vanilla to your homemade PB, just kicks it up a notch! 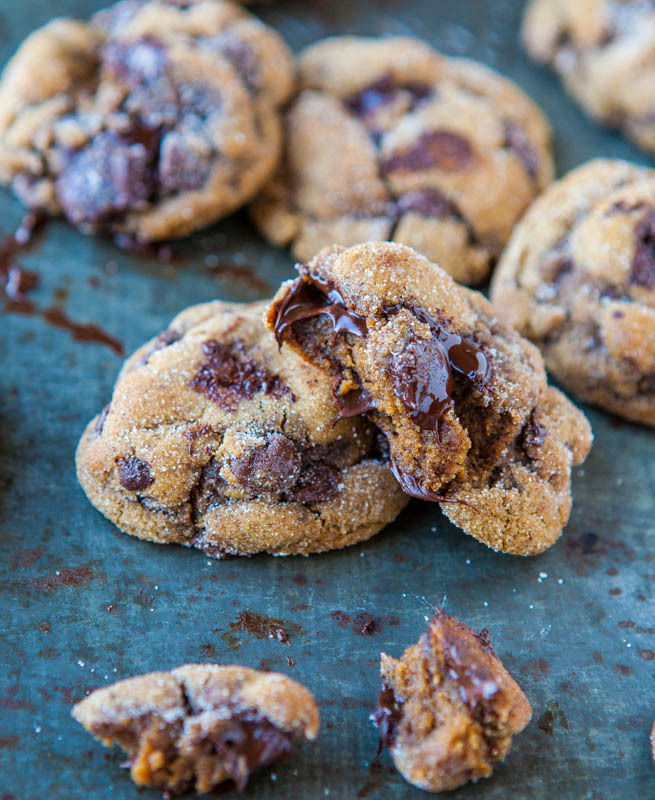 And sometimes I’ll separate batches of it and add a ridic amt of cinnamon or white choc chips or whatever…so good! Congratulations on being published! Yey! Let me do a happy dance for you…. OK, now, what was the question? safe travels…I am just getting caught up on blog posts from our trip to Punta Cana…can never get enough of the beaches! Love the tip on brownies…I did not know that…and slightly bummed since I love my stand mixer :-( but I love brownies so I will use my whisk!!! And congrats on the 2 page spread that is awesome girl!!!!! Well I hope you guys had a fabulous trip!! And the don’t over-mix comment reply, was in regards to your brownie comment/standmixer! :-) yep I knew…no overmixing for me now…love your tips! My only time of making my own butter is when, as a new bride, my husband wanted real whipped cream for a pumpkin pie. Well, I mixed it a bit to much and got – BUTTER – unsalted and all! With those gorgeous blue waters beckoning you from the window, your holiday appears destined for magical times, Averie. Congratulations on all your publication successes and thank you for sharing your gifts and goodies for and from the kitchen. Thanks for all your kind comments & support!